If sunlight strikes a solar panel, but we don’t use the electricity generated, is it “wasted”? In some parts of the country, so much solar energy is produced at midday that there is no use for it. Demand for electricity has already been fully met by solar and other sources of generation; the value of additional electricity on the grid is actually negative. If we have so much energy being produced at the height of solar resource availability that we can’t use the energy, does this mean we have effectively reached the limits of how much solar energy we can integrate into the grid? 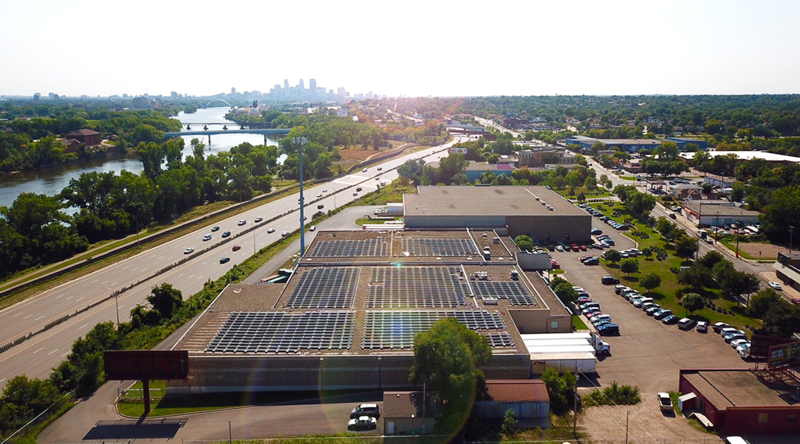 The Great Plains Institute is part of a team through the MN Solar Pathways project that is considering these types of questions in anticipation of the continuing investment in solar by residents, businesses, institutions, and utilities. 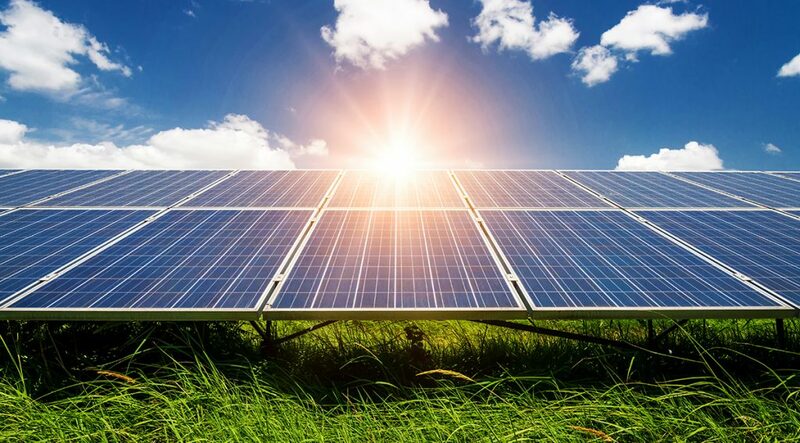 The MN Solar Pathways project is funded by the US Department of Energy and managed by the Minnesota Department of Commerce and seeks to understand the different pathways to meeting Minnesota’s 10 percent by 2030 solar goal. In a recent analysis published by Solar Pathways, the project looked beyond 2030 to consider a high-renewables future (2050), evaluating whether 70 percent or more of Minnesota’s electric energy needs can be economically met with a combination of solar and wind generation (and energy storage and load shifting). The Solar Pathways analysis found that the most cost-effective means of achieving a reliable high-renewables future is to design the system to use renewable energy when we need energy, rather than when renewable energy resources are most abundant. Even when that approach to system design results in solar generators being effectively turned off (i.e., curtailed) when they could be generating electricity. Like other forms of generation, solar (and wind) energy is most economic when designed to provide reliable, dispatchable energy. Minnesota currently generates approximately 2 percent of annual electric energy needs via solar energy. 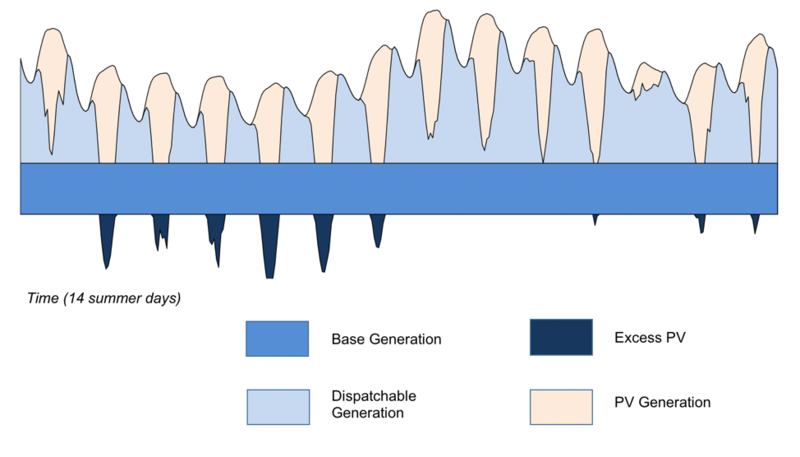 This level of generation is easily integrated into the grid, as is demonstrated in figure 1 that shows solar production and energy demand over a 14-day period in July. Solar resource availability is near its peak in the July daytime, but the amount of capacity installed is small enough that solar integration is simple to execute. The integration issue changes dramatically when Minnesota reaches its 10 percent annual solar generation goal. High solar resource periods, such as these 14 days in July, result in too much production relative to demand. 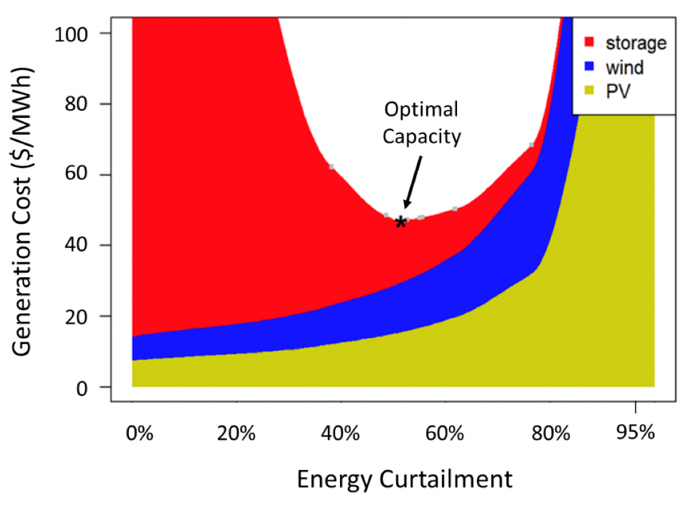 Figure 2 shows solar energy as a mature resource, which is the point at which we need to consider the questions of integration, dispatch, and curtailment. As shown in figure 2, solar production not only displaces the “must-run” generation, but significantly exceeds total demand. Can we store excess generation for use later? Can we move enough load to from morning or evening to noon, to absorb the excess production? Is it fair to simply not use the energy, to “curtail” solar generators? Concerns about not “wasting” solar energy production may be, ironically, becoming a barrier to solar energy being a significant part of our energy portfolio. Energy analysts, planners, and policy makers routinely characterize curtailed energy as “waste,” concluding that unless we find a way to use what is now excess energy, solar will not be an economic resource. These commenters correctly note the environmental dilemma of not using clean energy once it’s produced, and the challenge of financing renewable energy development if significant amounts of production are not used. But this begs the question; how dependent is the solar industry on being able to use this expected excess? 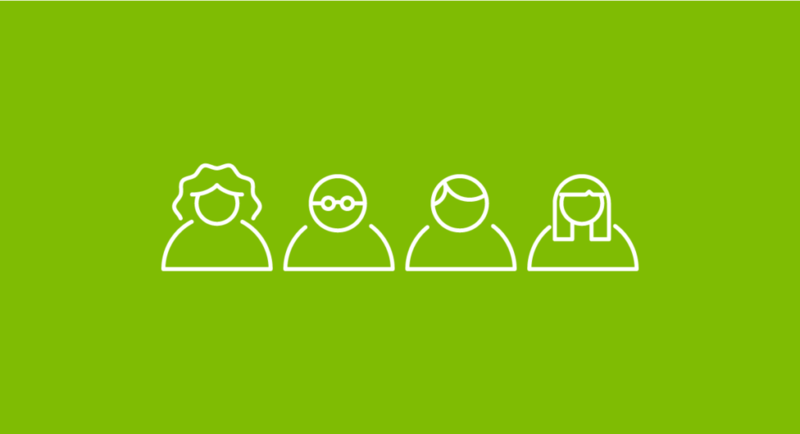 Is there a pathway to high levels of deployment that does not depend on using the excess? This “waste” mindset is consistent with our status quo energy system. Traditional electric generating plants are like factories. Inputs (fuel) are mined, processed, and delivered to the factory. The factory has a manufacturing process that uses energy and labor to convert the inputs to a manufactured good (electricity), also producing by-products that are waste and must be managed. Manufacturing a good (electricity in this case) and then not using it is rightly considered wasteful. The mining, refining, and delivering the fuel to the factory was wasted. The operation of the factory, the labor used in the process, and the management of by-products were wasted. Unless they can be stored for later use, the manufactured goods are wasted. For this reason, rather than generate electricity and then not use it, traditional electric generating stations are cycled on and off, or dispatched, based on need. But the factory metaphor does not fit most solar energy production. Solar generation is more like energy collection than energy manufacturing. We put solar collectors out to catch the sun’s energy where it spills in sufficient quantities. The sunshine does not need to be mined, refined, and delivered. Solar arrays have no (or few, in the case of tracking systems) moving parts, and no production process, meaning marginal costs are near zero. The conversion of sunlight to electricity does not produce by-products or emissions that need to be disposed or managed. And, the sunlight is going to fall whether we capture it or not; the sun’s energy is there regardless of whether we have a collector system in place. So, coming back to the original question; if our energy collector captures more energy than we need, is that “wasteful”? Not from a cost standpoint. The fuel, sunshine, has no cost, and was going to fall on the ground, or the roof, whether the solar array was there or not. Because there are virtually no marginal costs associated with producing the next kWh, no “waste” occurs as a result of not using electricity production that we don’t need. Not from a value standpoint. When the market value of energy is zero (or negative), and the marginal cost of producing the energy is zero, then discarding the energy is not waste. Energy storage can change this equation if the cost of storage is lower than market value of the stored energy. But when the cost of storage is higher than the market value of stored energy, discarding is not waste. A primary finding of the Solar Pathways analysis is that the cost-effective way to increase solar energy generation is to design solar energy systems to produce energy when we need it, and in quantities that match our energy needs. This might mean that we design systems to produce energy on cloudy days, or during low-resource times of the day (i.e., near sunset and sunrise), even if that results in curtailment at sunny midday. The analysis shows that a reliable and cost-competitive, high-renewables future (e.g., solar, wind and appropriate storage) is achievable, meeting 70 percent of Minnesota’s electric energy needs on an hour by hour basis for the entire year. The Solar Pathways project examined the perception about energy curtailment by modeling the economics of building significant amounts of solar capacity and then shifting the excess production to other times using storage or other techniques. The result: curtailing excess production is frequently cheaper than storing it for later use. And, by not focusing on the excess production at high-resource times (midday), and instead focusing on production when the value is highest, the solar energy capacity still pays for itself. Even if as much as 50 percent of the energy production is not used or stored. Dispatching solar production when it is needed enables more solar energy to be put into production at lower cost. Note: Storage capacity and generation cost is driven down through additional capacity (solar and wind) until the optimal solar, wind, and storage capacities are reached. Source: Reprinted from MN Solar Pathways Solar Potential Analysis, Nov. 2018. This result is hardly surprising in retrospect. Most traditional fossil fuel generation operates, on average, little more than half the time that they could operate. The national “fleet” of coal-fired electric generators, in 2017, had a capacity factor of about 54 percent. Combined cycle natural gas generation had a capacity factor of 51 percent in 2017. Table 1. Capacity Factors for Utility Scale Generators Primarily Using Fossil Fuels, January 2013 – October 2018. Like most other forms of generation, if solar energy is to be integrated into the energy portfolio as a fully mature generation source, it needs to be dispatched as needed, rather than dispatched whenever the fuel is available. Dispatching based on need means that the highest value solar energy is likely to be sometime other than solar noon. If the value of solar production at noon is zero, and the marginal cost of producing at noon is close to zero, discarding that electricity is not wasteful—it makes economic sense. The Solar Pathways project modeled the most cost-effective way to provide solar energy in a high-renewables future and determined that storage plays a critical role, particularly for relatively short-term and consistent use moving energy production from low-value to high-value times of day. Moreover, the interplay of renewable capacity, storage, and load shifting opportunities creates other value-streams that could use the otherwise idled solar capacity. The idle solar capacity during the middle of the day can, for instance, be viewed as a solar “spinning reserve,” a high-value component of our current energy system where turbines are kept spinning to be brought on line quickly when needed to support voltage or balance the grid power. A future blog will discuss some of these concepts, including whether solar and wind capacity can do more for our energy system beyond producing energy. Nuclear energy plants, which are “must-run” plants and can’t safely be dispatched based on energy need, had a capacity factor of over 90 percent. The national wind fleet, which only operates when the wind is blowing, had a capacity factor of approximately 35 percent. David Roberts, “A beginner’s guide to the debate over 100 percent renewable energy,” Vox, February 6, 2018, https://www.vox.com/energy-and-environment/2017/4/4/14942764/100-renewable-energy-debate. Andy Bilich and Laura Navarro, “A regionalized energy grid creates a home for California’s wasted renewables,” Environmental Defense Fund (blog), July 11, 2018, https://www.chicagomanualofstyle.org/book/ed17/part3/ch14/psec208.html. This blog, and the Solar Pathways analysis, looks primarily at the energy production value of solar, and does not focus on the potential other value streams that unused solar capacity can provide. Get the latest news and events from the Great Plains Institute by signing up for our monthly newsletter!